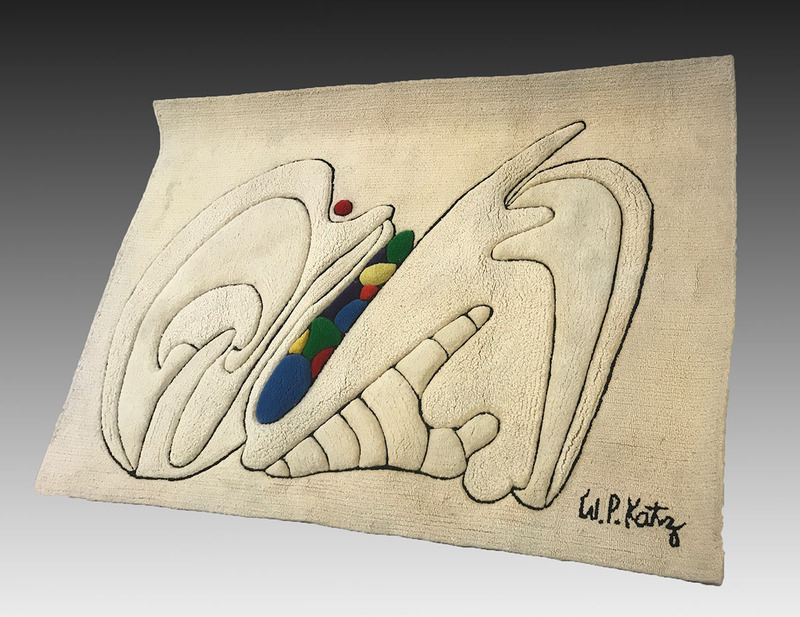 WILLIAM KATZ SIGNED HANDMADE ABSTRACT RUG, 4'' X 5'8'' APPROX 15-30 YR OLD ARTIST SIGNED HANDMADE MODERNE ABSTRACT RUG, 4'' X 5'8'': This intriguing piece of abstract art by W.P.Katz was made not with oils on canvas but with a combination of a woven surface that was then sculpted and shaved to create not only different levels and texture but also the overall design of the piece. Black outlining helps to further distinguish the design and the one lobe of colors near the center of the piece. This would be an interesting addition to a Moderne setting.